OLS offers a wide selection of mobile lift parts for Sefac. 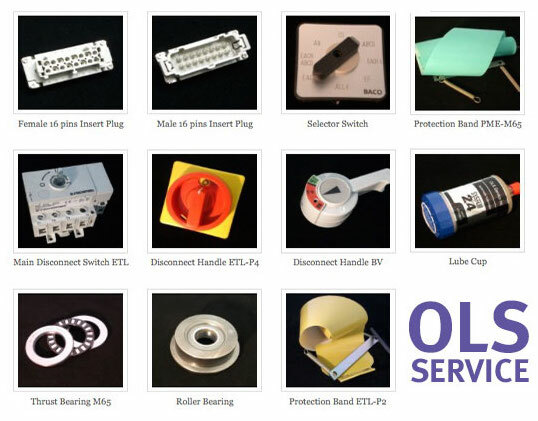 Whether it’s a broken dust cover, a torn cable or a critical main switch failure, OLS Service has you covered! Today more than ever, getting the Sefac parts you need can be a real challenge. That’s why more facilities across California count on OLS to source and deliver mobile lift parts every day. Need a part? Not sure about what to order? Call OLS any time, 24/7, from any time zone! We’ve got the expertise to deliver the right parts whenever you need them! Top notch industry experience prevents problems before they start! OLS Service is your expert choice for fast and dependable service with 20 years industry experience. Factory authorized by Sefac Lift and Equipment, Inc., as well as Gray Manufacturing, we’re here to provide you with year round safe and trouble free operation of your mobile lift and garage equipment. Most repairs are completed in a single service call, with most parts immediately available. At OLS, your safety and convenience is our primary concern. • Need a replacement part, or to schedule maintenance? Choose your most convenient option on our contact page for more information. OLS understands your needs and meets them quickly and professionally, always at a fair price. We take the time to know you better, to keep you safe and to make your job easier. Our decades of experience and degree training in electronics, along with Sefac and Gray specific training gives you a winning edge. We keep your down time at a minimum, and get you up and running faster than anyone else in the industry. The OLS Guarantee: You’ll receive best-in-class service, each and every time you call.